Subject: Test Release 4.9.1 of JMRI/DecoderPro is available for download. 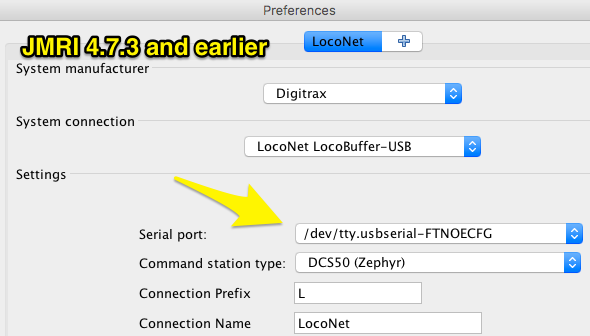 In general, previous versions used serial device names like "/dev/cu.usbserial-ABC123FG". 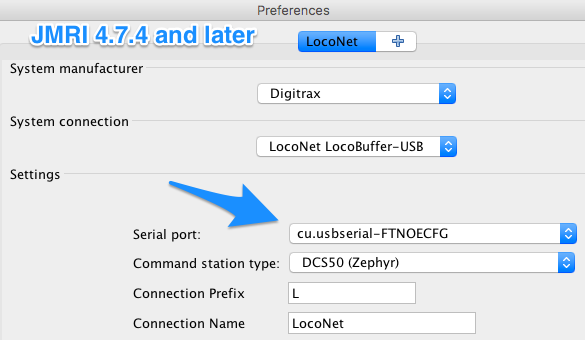 This version will generally omit the prefix, and use serial device names like "cu.usbserial-ABC123FG". (If given the choice between a name starting with "tty" and one starting with "cu", pick the "cu" one). See the before and after images to the right. Since JMRI 4.9.1, fixed 4.9.2 JMRI 4.9.1 will sometimes refuse to create a new profile. This can hit when creating a new profile in addition to existing ones, or when creating a new profile as part of an initial install. There is, unfortunately, no workaround for this. Since it can hit new users, we recommend that completely new users not use JMRI 4.9.1, but rather should stick with JMRI 4.8. This has been fixed for JMRI 4.9.2. You can also pick up a development build installer in the meantime. Since JMRI 4.9.1, fixed 4.9.2 If you have very large panels (lots and lots of items), JMRI PanelPro can start to slow down. This has been fixed for JMRI 4.9.2. You can also pick up a development build installer in the meantime. OS X El Capitan only: Reboot into Recovery Mode by restarting your Mac and pressing Cmd-R until the Apple logo appears. Once in Recovery Mode, select Terminal from the Utilities menu. It can take up to a half hour to complete. Wait for the message Removed Apple Java SE6. OS X El Capitan only: Restart your Mac. Because of issues with this test release, we recommend that you download and install [JMRI 4.9.3](jmri4.9.3.shtml) or later instead of this one. The CAN tools were updated for display and support of translations. The C/MRI tools were updated for display and support of translations. Added a jython/SendReceiveLocoNetPeerXfrMessage.py sample script for communication between two computers using LocoNet Peer Transfer messages. Traffic explanations in the LocoNet Console changed slightly to improve reading and allow localization. The ECoS tools were updated for display and support of translations. The Lenz tools were updated for display and support of translations. The Command Monitor can show translated descriptions. The Märklin tools were updated for display and support of translations. The Roco tools were updated for display and support of translations. Michael Mosher updated BLI decoders. Michael Mosher updated some decoder definitions: add new CV from V1.5 Eco manual and TSU-4400 models. Peter Ulvestad fixed some spelling errors in decoder definitions. Some of the text boxes for entering input (e.g. names of items to add) have been updated to selection boxes. A problem with reading really old panel files (pre-JMRI 4.0) was fixed. Chuck Catania added some ATSF CTC icons. The Turnout Table now makes it clear(er) which turnouts can use the turnout locking feature and which Connections don't have it available. Improved the turnout locking GUI in the Turnout Table to make it clearer what's going on. Added SensorGroupAutoItem sample script to handle the case of an "all-but-one" group. For example, if you have sensor inputs for the left and right positions of a CTC signal level, but not the center one, this will let you use an internal sensor for that position. SSL now has a "Restricting Speed" option that limits the fastest shown appearance to Flashing Red (Restricting). This can be useful in the entrance to a yard. A script can turn it on and off for e.g. permission to switch on a lead. Added Route and Traffic lock capabilities..
URL-encode roster entry Ids in URL paths and only in URL paths. Accept URL-encoded roster entry Ids in request paths in the Roster servlet. Accept URL-encoded types and object Ids in request paths in the JSON servlet. Made some changes to how JMRI validates panel files to accept how AnyRail writes the files. Quite a bit of code that has been deprecated since JMRI 4.2 or before was removed. A problem with validating XML panel files created by XtrkCadReader was bypassed. USB support using the USB library has been updated to usb4java and a new USB browser added.